If you are looking for a travel-friendly water flosser that operates on both 110 and 220 v, your search is probably over. I have to travel to Europe and Asia on business purpose at least 4-5 times a year. All I need a simple foreign plug adapter to use this tool in those continents. 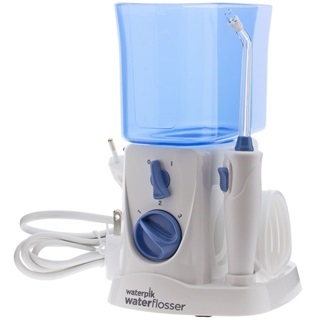 Waterpik WP-300 is neither too small nor too long, just the perfect size and weight. I don’t have to struggle much to find a space for it in my luggage. It easily fits in my small toiletry bag. If you are unsure whether a corded flosser like this would be a good option during trips, be assured that there’s nothing to worry about. It is not that tough to find an electrical socket in most countries in the 21st century. The cleansing action of the wired device is powerful enough for regular use. It doesn’t leak and most of all, you don’t have to worry about a dead battery. Sounds awesome in theory. 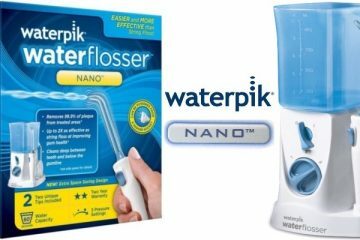 But is Waterpik Traveler Water Flosser really as useful as it sounds? Let’s find out, shall we? 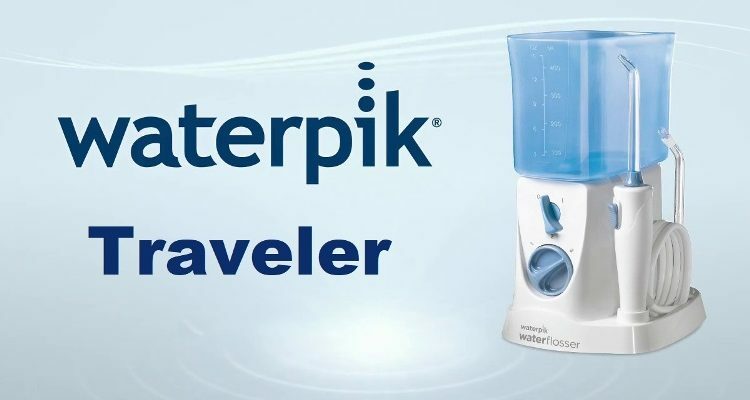 What Makes Waterpik Traveler Water Flosser Different? 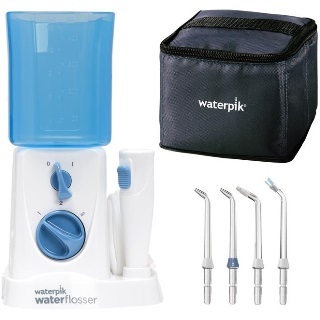 Is Waterpik WP-300 TravelerTM Water Flosser Worth Buying? 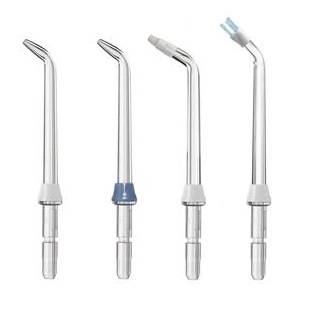 Size 5 x 5 x 6 "
Includes 4 tips: 2 standard flosser tips, a Plaque Seeker Tip, and a Pik Pocket Tip. The reservoir can hold 15 oz. or 450 ml. Of water, providing a flossing time of 60 seconds. Offers 3 pressure settings: 10 psi, 45 psi and 80 psi. Supports both 110 volts and 220 volts. Can be used in countries operating on a different voltage using a universal plug adapter. Only 7” tall and 4 ½” wide, fairly compact and portable. Comes beautifully sealed in a well-padded travel case. The most striking difference between Waterpik WP-300 and other travel water piks is the reservoir size. With 15 oz. (450 ml.) capacity, it has quite a large tank for a portable flosser. For my normal cleaning cycle, for which I use medium pressure, I’ve to refill only once. My business partner who travels with me uses the lowest pressure setting. He never has to refill. It offers only 3 pressure settings, which is not much compared to countertop models. Nevertheless, it gets the job done well. I have a sensitive teeth problem and sometimes my gums hurt. The medium pressure gently massages my gum and cleanses every possible corner of my teeth. 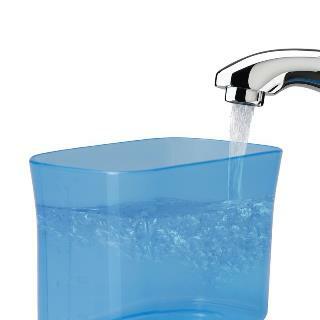 By the way, one of the greatest things about all Waterpik models is that they all are clinically tested. 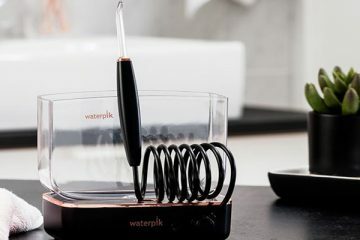 Waterpik conducts independent lab research to assess the credibility of their products. If we are to believe their claims, then WP-300 is 50% more effective than string flossing. It is also 3x more useful than traditional flossing around braces, crowns, bridges, and dental implants. It promises to eliminate 99.9% plaque from the targeted area under 3-seconds. If you think brushing alone is enough, trust me, it is not. 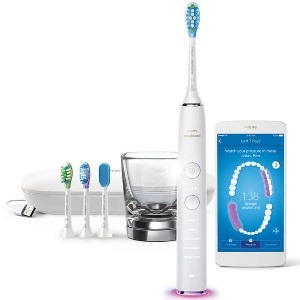 I remember my dentist complimenting me saying “nice to see you are taking good care of your teeth” 2 months after using this device. I can’t exactly point out what magic it does since I’m not a dentist. All I can say is that my mouth feels a lot cleaner, breath fresher and teeth a lot stronger. Frequent travelers like me will also love the global voltage compatibility of the flosser. Always carry a foreign plug adapter with you and enjoy flossing in any country, irrespective of the voltage. I don’t have to panic over the low battery since it is corded. It has a fairly compact build and I don’t mind keeping it my hotel’s bathrooms. Doesn’t take much space. I absolutely love the quality and design of the premium travel case included in the package. All the accessories fit snugly in it and there’s no fear of damage since the casing is thickly padded. 4 flossing tips- 2 classic jet tips, 1 Plaque Seeker Tip, and a Pik Pocket Tip. Not sure whether Waterpik should call it “Global voltage compatible” since it only works on 110 v and 220 v. What about countries using 230 v 50 Hz, 240 v 50 Hz or 127 v 60 Hz? Afraid not, you just need a universal plug adapter to run this flosser in any country around the water, as long as there’s electricity. It’s is not the smallest portable waterpik but it still fits quite easily in carry-on bags for airplanes. The empty device weighs around 1 lb. Which is convenient for overseas traveling. The design is simple and practical. Nothing fancy and does exactly what it is designed for. 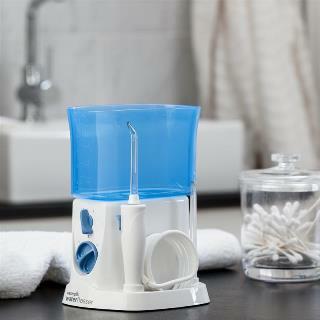 The flosser handle, nozzle and tip storage are neatly placed on the side of the unit. You will find the pressure dial which has 3 marks and a power switch at the base. The switches work smoothly. You will have to attach your choice of flossing tip on the handle. There’s a hole at the top of the handle where you have to put the tip and press. When you hear a “click” sound, it means that the tip is properly attached. There’s also an eject button on the handle to easily release the tip after use. The only thing its design lack is a 360-degree rotating tip. I’ll have to twist my wrist in order to find the perfect angle to remove debris and plaque. As I said before, it utilizes quite a big reservoir for a portable water flosser. With 450 ml. Or 15 oz. capacity, you might not even need to refill to complete full cleaning in low-mid pressure settings. You may have to refill once at the highest setting, though. That’s not a problem considering most handheld models require 3-4 refills. Moreover, there’s no lid on it which means refilling the tank takes zero effort. Such tanks are common only in countertop models. So kudos to Waterpik for successfully utilizing a large tank without increasing the flosser’s body weight too much. The reservoir can be flipped upside and transformed into a protective cover. This way, it doesn’t take up much space in your luggage. Clever! By inverting the tank, you will also prevent the chances of leakage. However, for complete leakage protection, dry out the fluid container completely before packing it in your bag. Also, make sure the tank is seated correctly while using to avoid mess around the sink. What’s even better is that the top rack of the container is dishwasher safe. Just remember to remove the valve from the base of the tank before putting it in the dishwasher. Also, do not forget to place the valve back on before using. It comes with 4 flossing tips. 2 Classic Jet Tips: Best for general use. Easily cleans the hard-to-access corners of the mouth and beneath the gumline. 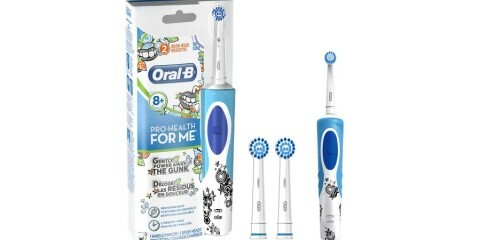 Also provides a gentle massage to your gums, making it ideal for people suffering from gingivitis and teeth sensitivity. 1 Plaque Seeker Tip: Does an excellent job of plaque and food particles removal around the braces. It has a cluster of thin, soft bristles which brushes your teeth while flossing. 1 Pik Pocket Tip: This tip is reportedly 50% more effective than string flossing on periodontal pockets. It can go much deeper in the pockets to rinse all the bacteria, debris and plaque. There’s a tip storage on the water flosser itself which can contain 1 tip. So one tip attached to the main unit and one on the tip storage means you can store two different tips on the flosser alone. This will come handy if you are sharing your flosser with someone else. No need to reach your toiletry bag to find your choice of tip every morning. By using the pressure dial at the base, you can choose between 10 psi, 45 psi, and 80 psi. The medium setting (45 psi) works best for me as it is neither too gentle nor too forceful. I don’t think the lowest pressure setting has any power at all to remove dirt from teeth gaps and gumline. Unless you have super sensitive teeth, any kind of gum injury or crowns and dental implants, choose the highest setting for quick and efficient cleansing action. Don’t start with the highest pressure right away. Begin with low or medium at first. I feel a beautiful tingling sensation in my gums while flossing. It kind of assures me that my mouth is bacteria-free and properly clean. 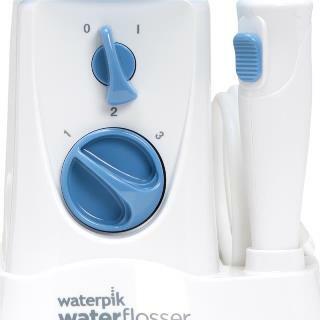 Don’t think that Waterpik WP-300 TravelerTM Water Flosser is flawless. Many users have reported that the machine overheats in high voltage. To be on the safe side, always use it with an adapter. Also, the unit lacks a 360-degree rotating tip. Therefore, you’ll have to twist your wrist to fully clean every corner of your mouth. Lastly, there’s no pause button on the unit, so you can’t stop the water stream in the middle of flossing. Most water flosser models have this feature these days. Yes, it is not perfect. But it is still one of the most powerful portable water flossers featuring a huge tank. There’s practically no maintenance required since the fluid retainer is dishwasher safe. Refilling is also easy as there’s no lid on it. You don’t have to deal with charging the batteries for hours as it is corded. Most of all, it is super convenient to carry wherever you go. It does everything a travel-friendly water flosser should do. Large water tank, 450 ml. Capacity. The tank can be inverted and transformed into a cover to save space. 3 different pressure settings to suit your different flossing needs. The tank is dishwasher safe. Dual voltage support, not global. Can be used anywhere in the world using a universal plug adapter. Starts to heat up in high voltage. Considering all the pros and cons, I can safely say that it is one of the best travel water flossers in the market right now. Not the cheapest but definitely value for many. The corded flosser can be used overseas, fits snugly in travel bags, offers 3 pressure settings and interchangeable flossing tips, hassle-free maintenance.